Big houses is what we call the posh large scale residences built by the super rich upper classes after the era of medieval castles concluded. They started to be built in the latter half of the 17th century, and took various forms, depending on architectural fashions. Some of these houses, mostly those that were built in the 19th century, may be called a 'castle' and may look a bit like a castle, imitating medieval features such as battlements and turrets. But none of those features are functional at this stage, they are only decor. 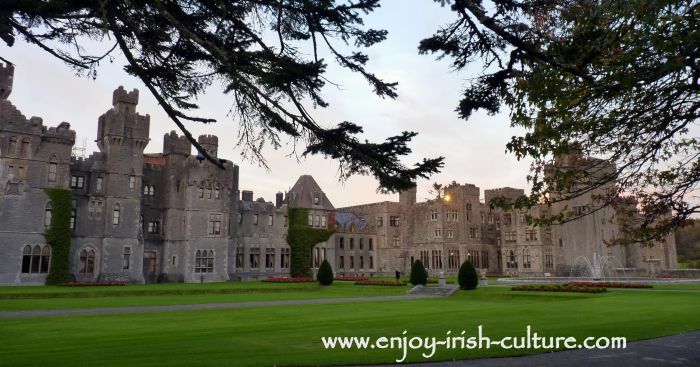 A good example for this is Ashford Castle in County Mayo, a Victorian castle in a neo-gothic style, and a 19th century build, seen below. Castle designs across Europe changed after siege guns started to be used. Once cannons came on the scene, it became clear very quickly that, ultimately, no medieval castle fortification was able to withstand an assault with cannons. So, you might as well not bother build fortifications, but rather, display your wealth. In Ireland, nearly all the wealth was now held by a new ruling class, the new ascendancy, who had come to power after the Cromwellian invasion of Ireland. It was this class who built so called big houses. Also called Stately Homes, country mansions, great houses, country houses or country lodges, these residences mostly date from the first half of the eighteenth century. The Palladian style was the most common. Examples for these houses include Castletown House and Emo Court (see lower down for photos of these) and Strokestown Park House which you can see on the next photo. These were architect designed mini palaces, luxurious residences built by those who had it all. 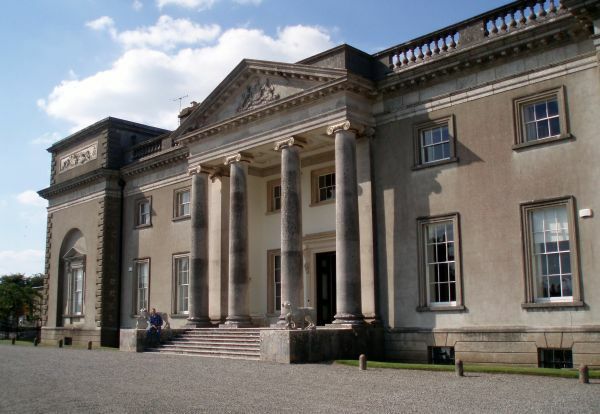 Ireland used to have 6,000 such mansions, now only a tenth of those are left. Yet, every part of the country still has its’ own. Some are government buildings, others are owned privately and lived in and are never open to the public, some are open to the public only at certain times, while some are run as museums. Johnstown Castle to the left, a 19th century big house. These posh residences were built by the landowning Anglo-Irish ruling classes who had come to power after the Cromwellian invasion of Ireland. Cromwell had paid his soldiers with parcels of land which he confiscated from Irish Catholic landowners. Many soldiers sold their land onto officers and moved back to England. In the end of this process around 7,000 soldiers and officers accumulated very large estates. This new Protestant ascendancy made up a tiny percentage of the overall population of Ireland. Yet they held all the wealth. Well's House in County Wexford was built in the 1830ies. The house is now open to tourists. Now at the end of the 17th century the fashion of the day was to display your wealth and that’s just what the new ascendancy did. Their large villas were lavishly decorated with art work and fashionable furniture, and the lifestyle involved expensive luxury dinners and parties. What Makes A Residence A Big House? Size is an issue! There are big houses of different sizes, the bigger the more important the owners were or wanted to be seen as. There was a lot of competition here. The more windows on the front and the bigger the stairs leading up to the main door, the grander the impression the residence left on the visitor. Many of these villas were trading for next to nothing up until the late 1980ies. 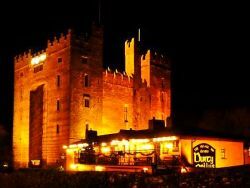 Like the Norman Tower House, these properties were undervalued by Irish people because of their history. 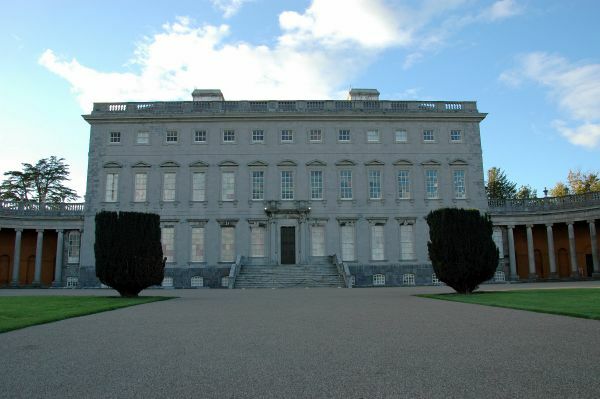 Castletown House (above) was built between 1722 and 1729 and belonged to William Connolly, speaker of the Irish House of Commons. This was a house throwing lavish parties everyone wanted to be invited to. Photo courtesy of Jellyshots. For many people, even to this day, there is something objectionable about the notion of these residences because they are associated with colonial times and with the famine when the glamour landlords lived in contrasted with the abject poverty their tenants and servants had to put up with. It has to be said that while the Irish situation was extreme because of colonialism, the basics of landownership were the same all over Europe at the time. Wherever you went, there was a feudal upper class that owned most of the land, and poor peasants were dependent on them for employment as labourers or servants. 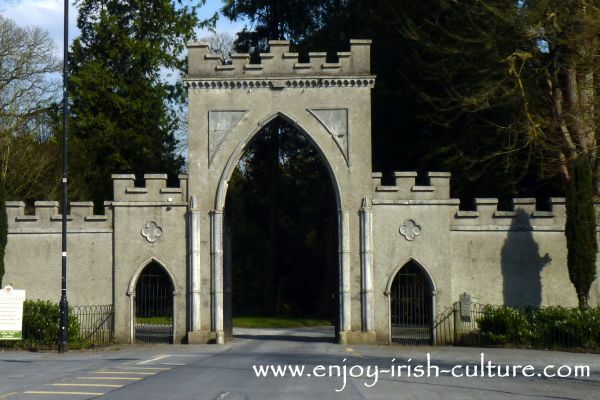 We can’t deny that in Ireland, the estate as well as the big house itself were an important part of the local economy. It provided much needed employment for agricultural labourers as well as servants. 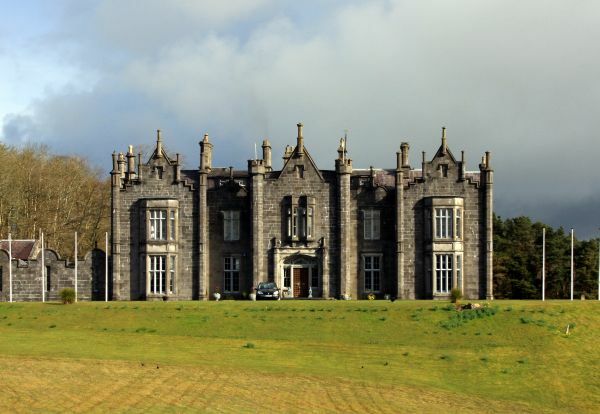 Beleek Castle in Ballina, County Mayo, was built in 1831. Photo courtesy of blackburnPhoto. Usually these residences are surrounded by a park land called domain or demesne. The demesne was usually formally designed to frame the building in an appropriate setting like on the photo on the right at Strokestown. Part of the demesne might be a woodland park. Usually there will be a walled garden and orchard nearby where vegetables, fruit and herbs were grown. There will be stables and other outbuildings, maybe a dairy. At the house itself, there were strictly separate quarters for servants and the owner family. Servants were kept out of view of the family by varying means. Often, servants were housed in the basement where the architects might have also located the kitchen, wine and beer cellars, i.e. those areas of the house that servants needed access to in order to do their work. 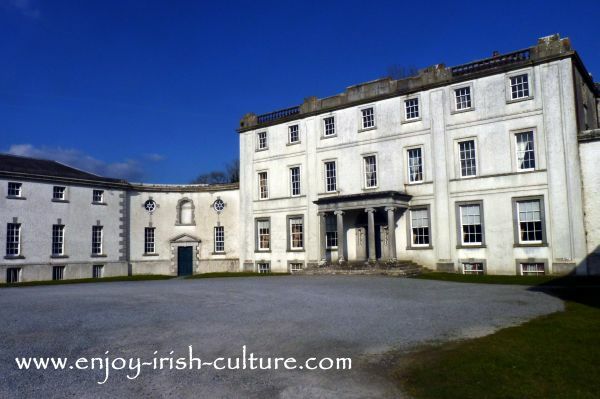 Sometimes the servant quarters were in a separate wing like at Strokestown Park House. The house will have a grand entrance area, designed to produce a ‘Wow’ effect. It might have a Cathedral ceiling or a large sweeping stair case. There will be impressive dining and drawing rooms where madam and sir showcased themselves in splendour. 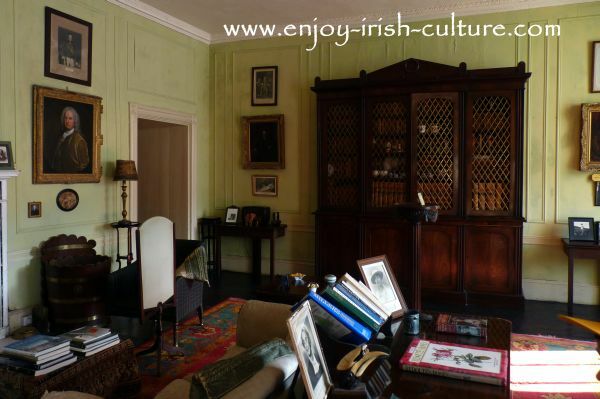 See the drawing room at Strokestown Park House on the picture above. Madam and sir had their own separate quarters, usually upstairs, and their own personal attendants. 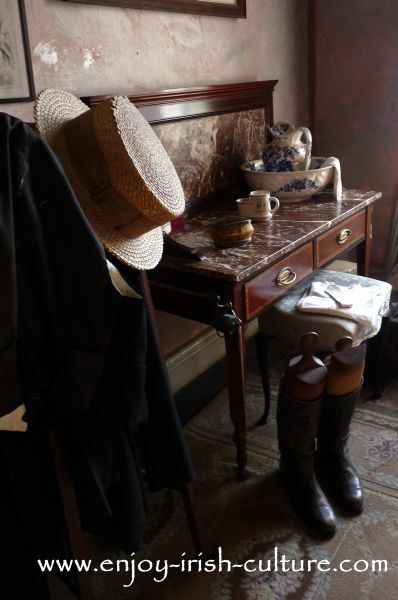 See the dresser in the gentleman's bedroom at Strokestown Park House on the next photo. 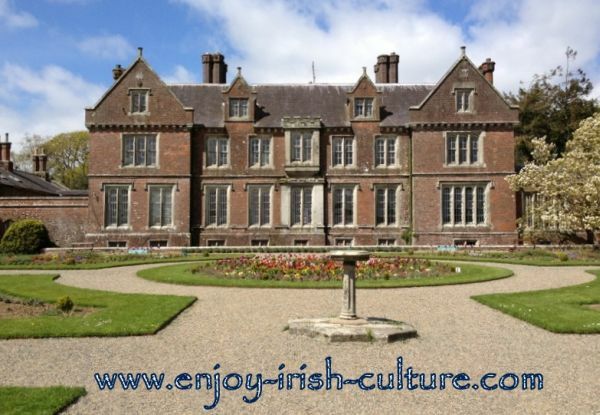 How Did Irish Great Houses Compete Internationally For Grandeur? Good question. I don’t think the Irish great house able to compete very well internationally, say with the splendour displayed in French or English palaces. A contemporary once said that Castletown was the only big house in Ireland that deserved to be called a palace. Irish mansions were looked down upon somewhat by the English. They had a reputation of putting food before decoration, not exactly a good thing by Victorian standards! The reason they didn't compete very well? You have to realise that Ireland was an English colony back then. And what is the role of a colony? First and foremost the role of a colony is to be exploited for natural resources. And that is exactly what happened. Very little of the wealth produced in Ireland was reinvested here. Most of it financed the lifestyle of absentee landlords. Yet, the contrast within Ireland between the riches of the resident upper classes, and the poverty of the masses was simply staggering. The building boom came to a halt at the onset of the famine. Throughout the late 19th century the Anglo-Irish landowning ruling class gradually lost power. In 1860, 90 percent of all land was owned by Protestant landlords. However, the introduction of successive land acts now finally enabled Irish Catholics to purchase land. Between 1870 and 1923 around 75 percent of all lands passed from landlords to tenants. The sale was financed by the government in London. Estates had huge bills for the upkeep of mansions and the expected standard of living. Many estates were in debt at this stage, and the income from the sale of land was welcome. In the end many estates sold all the land they had owned keeping only the house and its immediate surroundings, the demesne. The high time of the new ascendancy was gone. Many of these residences now fell to ruin and were abandoned. During the War of Independence, 199 of them were destroyed. They were seen as a symbol for Irelands’ colonial past, and thinking of the contrast to the poverty tenants lived in, many thought of the big house as a cause of the famine. Thankfully that attitude has shifted in the last ten years or so and people are slowly but surely beginning to appreciate the place of estates and stately homes in Irish history. Your help in growing our readership is much appreciated. It will only take a few seconds of your precious time as we have provided convenient social functions, just pick your preferred option. Thanks a million for the shout out! 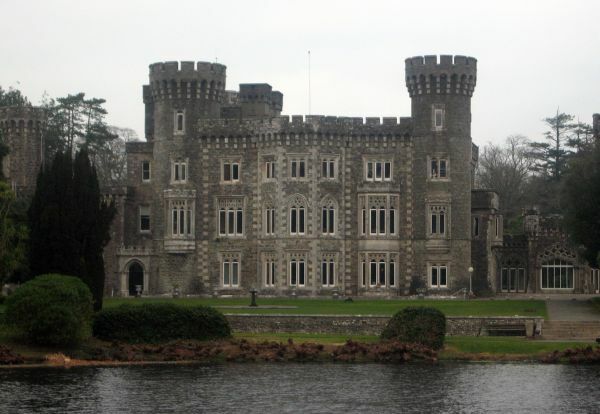 Return to Irish Big Houses And Revival Castles.